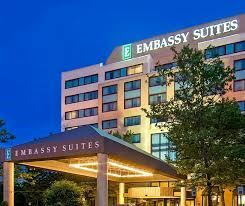 Embassy Suites by Hilton Boston Waltham, located in Boston’s High-Technology, Pharmaceutical, and Life Sciences Belt and corporate corridor along Route 128 and Highway 95. Our Boston/Waltham, MA hotel is just 20 minutes to downtown Boston and 25 minutes to Logan International Airport, convenient to Brandeis and Bentley Universities as well as Wellesley and Regis Colleges. The hotel provides complimentary parking, a 24-hour BusinessLink™ business center, heated indoor pool, and 24-hour fitness center. Meet with each other in the Atrium Lounge in the heart of the hotel. Unwind in your spacious two-room suite with separate living area, additional sleeper sofa, wet bar and refrigerator. If you need more space, reserve the 1,200 sq. ft. Governors Suite with larger living area and bathroom or the 1,600 sq. ft. three-room Presidential Suite. A Block of rooms have been reserved for July 4, 2019 – July 7, 2019. The special room rates will be available until June 7, 2019 or until the group block is sold out, whichever comes first.